The power plant for a Stanley Motor Carriage is the steam engine located at the rear of the car. They are unimpressive to look at unless their copper casings are brightly polished and lacquered. 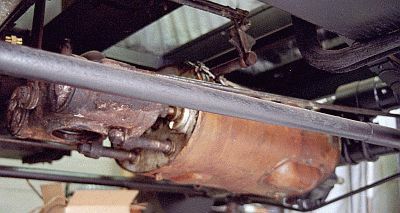 A copper case filled with insulation covers the cast cylinders (copper cylinder cover is removed in the photo at left) while a larger case is filled with steam oil to lubricate the bearings, slide rods, gears, and Stephenson Linkage. The Stanley engine is very simple with only 13 moving parts compared to the hundreds which make up an internal combustion engine. The Stanley engine is mounted to the rear drive axle at a nominal 1.5:1 gear ratio between the engine's crankshaft and the differential gear. Transmissions were not required and hence there is no "neutral" or clutch. Unlike the internal combustion powered car where the engine provided the horsepower rating for the vehicle, a steam car was rated by it's boiler's steaming capacity. Thus Stanley cars were rated as 10, 20, and 30 horsepower even though a typical 20-horsepower car's steam engine was capable of developing nearly 125 horsepower. 1) Water is heated at constant pressure (ideally) in a boiler. 2) The water is evaporated into a saturated vapor (known as saturated steam). 3) The saturated steam is further heated (called superheating) to gas. 4) In the engine the gas is allowed to undergo a controlled expansion (i.e. produces work). 5) The expanded (spent) steam is exhausted from the engine to condenser. 6) The spent steam is condensed back to water where it can repeat the cycle. Stanley made a number of engine sizes over their 25 years of production. By far the most common engine was the 20-horsepower engine used in cars made from 1910 through 1924. A 20 horsepower engine had two cylinders placed side by side and lying lengthwise of the car. The steam is admitted to and exhausted from the cylinders with valves located between the cylinders known as "D" slide valves. The valve gear is Stephenson Link and is controlled from the left driver pedal. The piston diameter is 4 inches and the stroke each piston makes in the cylinder is 5 inches. A steam engine is the only engine that produces maximum torque at standstill. When a Stanley's nominal 600-pound boiler steam is applied to the two 4" diameter pistons nearly 7 tons of force is generated to push against the crank shaft. Both pistons are connected to a common crankshaft that has a 40-tooth gear at the center which mates to the 60-tooth differential gear. All the steam engines are "double acting". This means that pressure is applied to both sides of the piston as the engine operates. The 4 inch piston of a 20-horsepower Stanley engine is pushed by steam to one end of the cylinder (the cylinder is 5 inches long) and then it is pushed in the opposite direction by steam. The internal combustion engine's pistons are only pushed in one direction from the explosion caused by igniting the air-fuel mixture. This means that the steam engine's pistons produce power every stroke they make in the engine's cylinder as compared to the internal combustion engine where the piston only produces power for 1 in 4 strokes it makes within the cylinder. Thus in one revolution of the crankshaft, a two cylinder steam engine like the one in a Stanley, produces as many power strokes as an 8 cylinder internal combustion engine does. A steam boiler generates vast quantities of power for later use on demand unlike the internal combustion (Otto cycle) engine that must develop the needed power on demand. A Stanley steam engine provides four power impulses per crankshaft rotation similar to an 8-cylinder internal combustion engine. The power is applied uniformly for a longer length of the stroke than the hammer-like explosions common to gasoline or diesel engines. By the piston being actuated by the cushion-like expansive force of the steam there is less pounding and jarring of mechanical components resulting in a highly uniform and steady application of power to the rear wheels. Additionally, with the internal combustion engine cylinder pressure is maximum at the moment of fuel ignition and rapidly tapers off as the piston moves. With the steam engine steam is admitted for up to 80% of the stroke which provides more uniform power for a longer duration of the stroke. The long stroke of the steam cylinder along with a continuous even push of the piston much of the length of the cylinder provides the steam engine an advantage of more torque in a smaller package over what can be generated with a gasoline engine of equivalent rating. There's definitely more power per pound in the steam engine than in an internal combustion engine of equivalent crank-horsepower if you neglect the boiler generating the superheated steam. In fact it is the boiler of a steam car that partially contributed to making them impractical. The problem with a Rankine-cycle engine in the early 1900s was that the boiler had to be heavy for the pressures involved. The sheer mass of steel and water took time to heat and start generating steam. Today's metallurgical technologies weren't available to make weight-efficient boilers. Compounding the boiler problem was the heat source (pilot and burner) and the inability to convert enough water into superheated steam fast enough. It is interesting to note that the boiler problem was resolved after Stanley went out of production with Doble introducing the flash boiler and oil burner (the Doble vaporizing oil burner was the prototype for the modern fuel oil heater we use to heat our homes today!). Had the Dobles entered the steam car business at the time the Stanley's did with their burner design we might be driving steam-powered vehicles today (this also presupposes that the Stanley's would have teamed up with Henry Ford to assemble cars on a production line instead of one by one by hand as the Stanley's did). The steam engine in a Stanley turns at quite a slow rate as compared to an internal combustion engine. There is no transmission on a Stanley as the gear on the steam engine crankshaft is directly engaged with the ring gear of the differential. There doesn't need to be a transmission as the engine can be stopped when the car is stopped ~ its just like a steam locomotive. The speed a Stanley engine turns when traveling at a given speed ~ lets say 30 miles per hour ~ is actually more a function of the car's tire diameter than anything else. For a 1918 Model 735 the tires are 36 inches in diameter giving a circumference of 113.112". With 5,280 feet in a mile, that equates to 63,360 inches per mile and thus means a Stanley wheel turns 560.153 times per mile traveled. Thus, if the Model 735 were traveling along at 30 MPH, each wheel makes 16,804.582 revolutions per hour, or is turning at a rate of 280.08 revolutions per minute! The gearing ratio between the differential gear and the engine gear is 40 teeth on the engine gear and 60 teeth on the differential gear giving a 1.5:1 ratio. Thus the engine must turn at a slightly higher rate or 420.1 RPM when the car is traveling at 30 MPH. To look at it slightly differently, a Stanley car traveling at 30 miles per hour has the engine turning over at a slower speed (420 RPM) than an internal combustion engine idles at when at rest (typically 650 RPM)! The steam engine's crankshaft is turning 840 revolutions per mile traveled (the wheels rotate 560.153 times per mile traveled and the engine crankshaft turns 1-1/2 times for every wheel rotation). With that slow speed there's not much opportunity for wear of engine parts. things such as the rollers in the 4 bearings and similar "incidental" parts.